NHA has recently learned of the passing of Mrs. Betty Stuyvesant on May 30, 2017. Betty and Bill Stuyvesant were part of the founding members of NHA and many will remember Betty from the years she spent working in the NHA National office in San Diego. 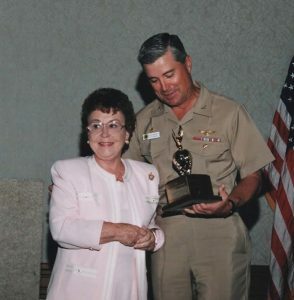 The Stuyvesant Family sponsors the annual Captain Bill Stuyvesant Award for Best Scribe for articles in the NHA ROTOR REVIEW Magazine given annually during the NHA Symposium. NHA sends our deepest condolences to the Stuyvesant Family. Fair Winds and Following Seas! There will be a burial at sea with the family and no public service is currently planned. The Stuyvesant Family request in lieu of flowers, donations in her memory be made to either the NHA Scholarship Fund or the American Red Cross. Betty loved being part of NHA and spent over 50 years serving the American Red Cross. If you wish, you may contact the family through Mr. Joe Stuyvesant stuyvesant@aol.com .